Hey all, I hope everyone is doing well. I have been bit busy nowadays. As some you have read that I had neck and upper back sprain few weeks back, I had my 2nd physiotherapy session yesterday, and some other tests for another shoulder issue,which was troubling on and off. All is good, I am just in prevention mode, and taking care of the issues, which I was suppose to h=get checked! Yesterday was my blog anniversary, I cannot believe but I completed 3 years of blogging. Thank you all for inspiring and stopping by my blog, I have made many bloggy friends here since 3 years, and I do consider some of them as my friends. A heartfelt thank you for to those who have been following my blog. Ok, to the card now, this one was started on Monday night , and I managed to finish it yesterday night. I chose a kraft base and used winnie&walter stencil to ink up using distress inks 3 shades of pink. 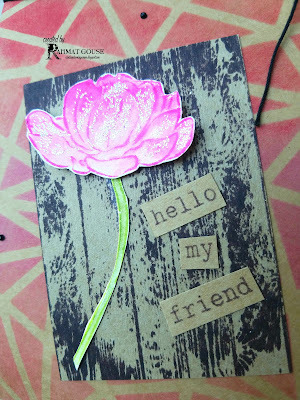 I then used the woodgrain texture stamp also from w&w to stamp on kraft using black ink, and added it angled. The flower is stamped using ripe permission on a water color paper and colored using distress inks and zigs. I decided to stamp the sentiment also on kraft and added in thin strips, finished off with 3 black rhine stones and a layered black twine, with a single bow! I hope you guys like what I came up with. Great card! I love the ink blending on the colored cardstock! Thanks for joining me for my Ink Blending Challenge! Lovely card and the background looks great !! Such a pretty card. Love the background you made. Thanks so much for playing along at Time Out this week. Awesome card, Rahmat! I especially love how you've used the woodgrain with black ink on the craft! Just beautiful!! Wow, congratulations on completing 3 years!! Yippie for you!! Congratulations on three years of blogging! 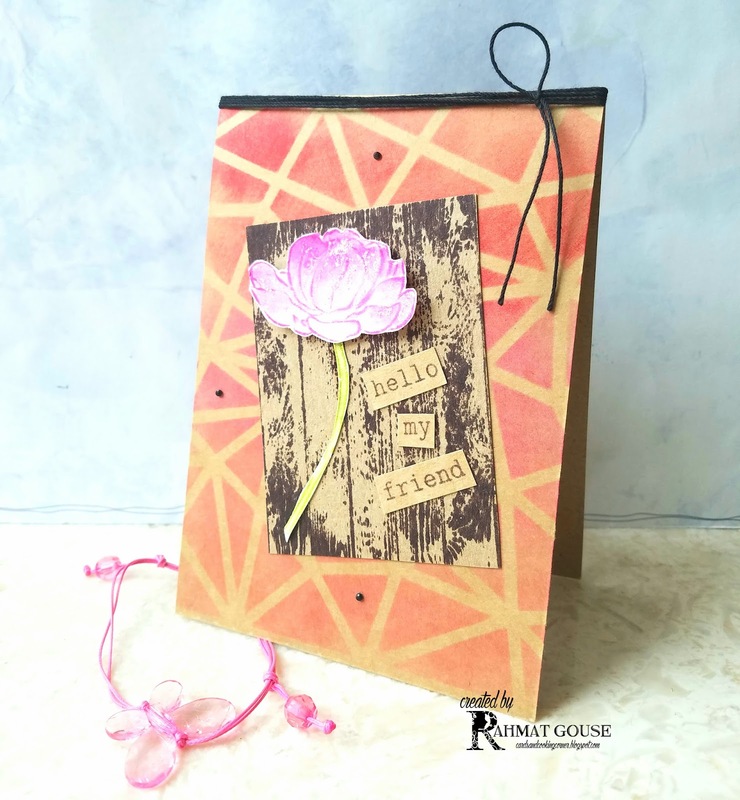 This card is so neat-- the card, the woodgrain panel, and the flower are individually wonderful... put them all in one card and you've made magic! What a beautiful effect the inkblending on the Kraft! Makes a strong bakground! Thank you for joining us at TIME OUT! Congrats on your 3 year blogoversary!! Lovely card with a gorgeous flower. So glad you joined my stencil challenge at Winnie & Walter! !